Volkswagen Golf 7 1.2 with an automatic transmission. The solid appearance of the car deserves your attention. The car has a comfortable interior and is characterized by the excellent handling and superior dynamics. It is ideal for successful people that love speed, style and beauty. 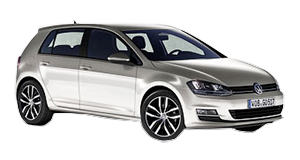 The reliability of the car is comparable to the functionality of Volkswagen Passat TSI with an automatic transmission. Your choice of this car is highly recommended! Name Surename Age Phone number E-mail address Pickup date 12345678910111213141516171819202122232425262728293031	 JanuaryFebruaryMarchAprilMayJuneJulyAugustSeptemberOctoberNovemberDecember	 201920202021	 Pickup time 000102030405060708091011121314151617181920212223	 00153045	 Receipt place Airport Rīga RIX Rīga Central train station Other Place Trip number.